Hello everyone, My name is Adam. I am a Board Member of Dystonia Europe and Board Secretary of the Polish Dystonia Association. I am also a founder of a Facebook support group for dystonia patients and I run a website called ”Dystonia Good Story”. I am Polish but I live in Ireland. Paradoxically, my work as a Patient Advocate began in the most difficult period of my life. I noticed the first symptoms of dystonia right before my final high school exams, when I was 22 (I’m 34 now). It began from shaking of the head in stressful situations. Then, when I started my first job, my neck muscles started to cramp and turn my head to the right. I decided to talk to my mom about what happened to me. Soon afterwards I visited a neurologist who diagnosed my condition as cervical dystonia. I did not break down. I was glad that I knew what caused my problems and that there was a method to alleviate the symptoms. I got my first botulinum toxin injection which worked well for me. The symptoms did not disappear entirely but for the next 8 years I was able to work and live an almost normal life. 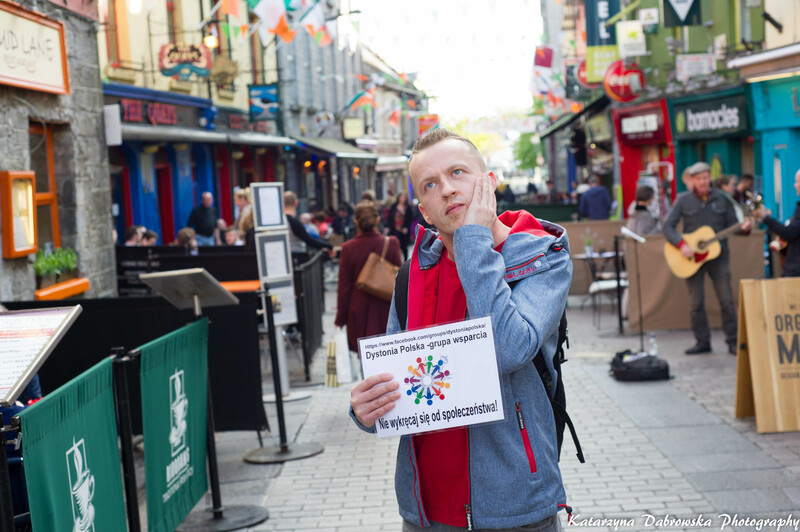 I moved to Ireland because I couldn’t find a well-paid job in Poland. In Ireland I worked, passed the driving test and bought my first car. Fascinated by the Irish landscapes, I passionately travelled around the island and particularly enjoyed mountain climbing. My neck was still far from ideal and I had a lot of complexes about it but thanks to botulinum toxin injections I felt no pain and the symptoms were so mild that the people around would not notice them. needed to talk to someone who would understand me. I also needed information which I could not find anywhere, so I decided to launch a support group on Facebook for people with dystonia in Poland. I didn’t realize at the time how big a need there was for such support. The group was growing fast and today has nearly 350 members and is an official support group of the Polish Dystonia Association. Through the group, I met the president of the Polish association and we began to work together. Soon afterwards I was nominated and elected a secretary of the association’s board. Around that time I got interested in the MyDystonia application, a digital diary for dystonia patients. The application is not available in the Polish language so I decided to create video tutorials with Polish translation to help Polish patients use the application in the English language. 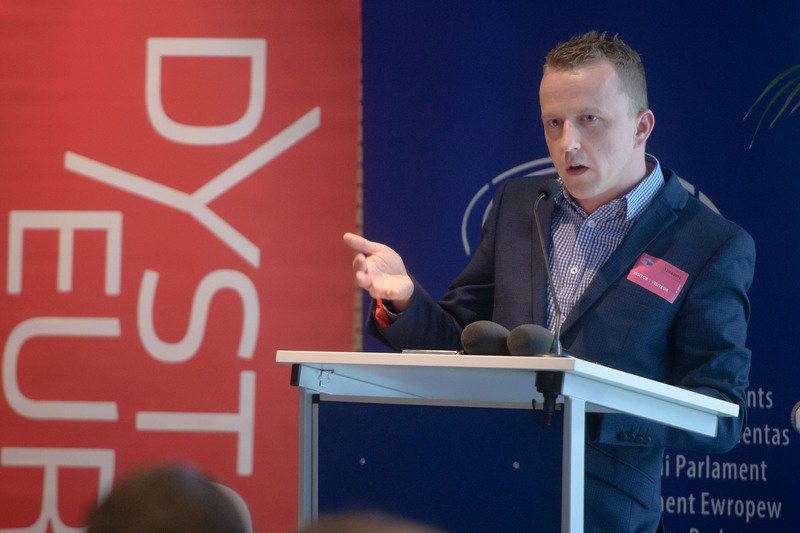 Dystonia Europe quickly noticed my videos on the Internet and invited me to a meeting of the application ambassadors and I became MyDystonia ambassador to Poland. My cooperation with Dystonia Europe was gradually developing and I finally was nominated as a candidate for the board. In 2017, during the general assembly of Dystonia Europe, my nomination was formally approved. Today, as a DE board member I am responsible for coordinating the activities of MyDystonia ambassadors across Europe. most entirely which was the most important to me. Because of a long-term medical leave my employer discharged me. Then I decided to change my career and start working online. I began to learn about internet marketing, in particular the social media marketing. I set up my own company. Today, my neck is still not good but I believe that the exacerbation of my condition was for some purpose. I found my mission in working for the patient organization. I attend many conferences and workshops across Europe to develop my Patient Advocate’s competences. After spending eight years doing a job which I didn’t like, I finally do the things that give me pleasure. I cannot drive a car yet but I can climb mountains again. My personal experience taught me that the most important thing is never to give up and look for inspiration from other patients who successfully dealt with dystonia. I founded a website called ”Dystonia Good Story”. I wanted to find people who managed to overcome the limitations caused by dystonia and publish their stories on my site. The stories are meant to inspire other people and give them hope to return to normal life. If you have such a story and wish to share it with others, please get in touch with me on dystoniastory.com . Always dream. Never give up!